4 x Motorised Auto Focus Lens 3.3-12.0mm 4MP Dome Camera with & Ultra HD 5MP NVR Analytic CCTV System. This system comes with a two year warranty on all components. Would you like a fully moveable Pan, Tilt & Zoom Camera on your system? Click here for more information. This particular system is for those who wish to have the more advanced CCTV setup. The cameras and recorder use the latest analytic technology allowing you to create intrusion zones, digital tripwires, missing object detection and exceptions. As you can imagine there is a massive variety of how you can customise each camera to your system. Click here for more information on analytics. The Ultra HD IP systems utilise the modern H.265 Compression so you can enjoy the higher resolutions but not be penalised when storing the data on your hard drives. 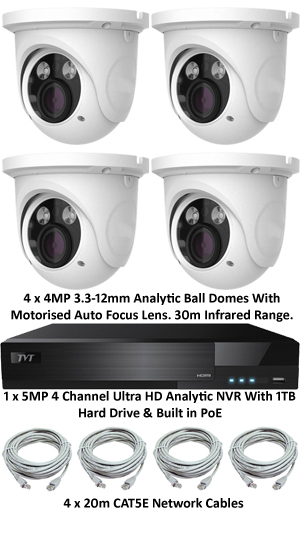 4 x Motorized Auto Focus 3.3-12.0mm Ball Domes with 30m infrared range and analytics. These cameras will record in 4 mega pixel (2560 x1440) resolution, twice the resolution of Full HD. Using the more modern H.265 compression, these cameras use 40% less bandwidth than H.264 but does not sacrifice image quality. The camera is equipped with a motorised auto focus 3.3-12mm lens which offers a wide angle view and 30 metres of infrared illumination for night time recording. The 3.3-12mm ball dome is very straight forward to mount as they can go onto any flat surface with just four screws and then just connect the RJ45 CAT5/6 cable for the power and data. A spare DC power socket is available for non PoE uses. If you would like a different style of camera, please see the options above. 1 x 5MP 4 Channel Ultra HD NVR (Network Video Recorder) with Built-In PoE (Power over Ethernet). This NVR will record four 5MP cameras and comes with a 1TB Hard drive installed. 1TB on two 5MP cameras will give you up to one and half weeks recording continuously. This is calculated by using the H.265 compression and having the frame rate set between 10-15fps per camera. If you desire a longer recording time, simply select for a larger hard drive in the options above. This particular recorder has five RJ45 LAN connections, one is an uplink, the other four are PoE ports. This is instead of using a separate external PoE switch. The NVRs are a very powerful, sophisticated recorder. We have these units used in high priority locations such as airports, museums, government establishments, banks and factories which all make great use of the analytic functions available. Analytic CCTV is a key function used in our newfound digital era to convict people by catching the footage and alerting it immediately with the highest clarity. The CCTV systems have a private app for remote viewing on your smart phone, tablets, PC's etc. Select the link to see how it is done. 4 x 20 metre CAT5E Network Cables. This system runs over Ethernet cable, the cable already has the connections on both ends so you don’t need any tools to fit them. Longer lengths of cable are available, see the options above.